Full name Dylan Marlais Thomas. On combining works of this author: Please take note that editions of the "Poems" can be different works (selections as opposed to complete works). Identical titles alone do not indicate identical works. Through the magic of the written word, we are going to transform our quaint little Alaskan farming town into a quaint little Welsh fishing village. Come to Fireside Books to hear an informal dramatic reading of Dylan Thomas's masterpiece, "Under Milk Wood." This musical poem-play imagines one spring day in the town of Larreggub, with all sorts of characters and foibles. It's sad, funny, and a little bawdy, but the play of language will keep you captivated the whole time. Fireside Books is presenting this dramatic reading as part of the Second Saturday Art Walk in Downtown Palmer. All month we are celebrating the 100th birthday of Dylan Thomas, who was born October 27, 1914. This is a free event, presented by special arrangement with Samuel French, LTD. Please note: We will be moving some shelves around, starting at 3 PM. Some sections may not be accessible for browsing after 3. The Dylan Thomas 'Pop-Up Writing Shed' will visit NLW 28-30 August (the bank holiday weekend), and will park at the front of the building. This shed is a replica of Dylan Thomas’ iconic writing shed in Laugharne and will be on tour throughout 2014 as part of the centenary of his birth. Be prepared to see the shed 'poping up' in all kinds of places across Wales. Dylan Thomas, A Child's Christmas in Wales. ; Truman Capote, A Christmas Memory. Dylan Thomas's book The Art of Losing was available from LibraryThing Early Reviewers. 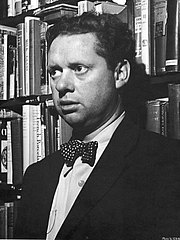 Dylan Thomas is currently considered a "single author." If one or more works are by a distinct, homonymous authors, go ahead and split the author. Dylan Thomas is composed of 8 names. You can examine and separate out names.